Plot: A prequel set during the ‘wild west’- Hiram Gummer (Michael Gross-playing an ancestor of Burt) is the eccentric owner of a silver mine that is the lifeblood for a nearby town known as ‘Rejection’. But when the miners are attacked by giant, underground, carnivorous worms known as ‘Dirt Dragons’, he must get all the hired guns he can afford. Because unlike his descendant Burt, Hiram hates weapons and is a bit of a dandy. 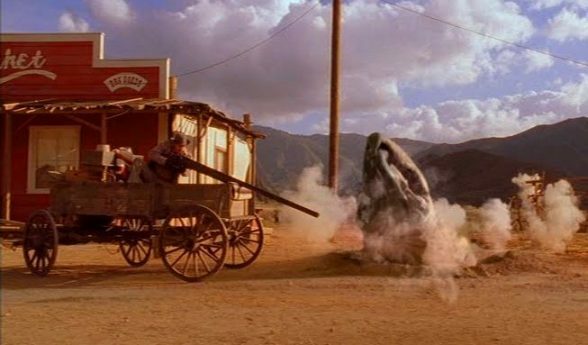 I doubt anyone would’ve predicted that the “Tremors” franchise would pursue the prequel route and change its setting to the ‘wild west’, because…The idea sounds really f@cking stupid…and kind of amazing. I suppose it makes sense when you consider that the trilogy had a western motif going on, but do we really need an origins story that isn’t really an origins story? We learn that Graboids are hatched as miniature versions of themselves and they can propel out of the ground during this form, snagging their prey. We learn that the town of Perfection was besieged by Graboids in the past, although there is never any indication as to why this area seems to be a popular breeding ground for the beasts. We also learn why Burt loves guns, but I don’t think this is a question that needed answering…Also, Burt says he moved to Perfection for its isolation, yet “Tremors 4” implies he was born there. 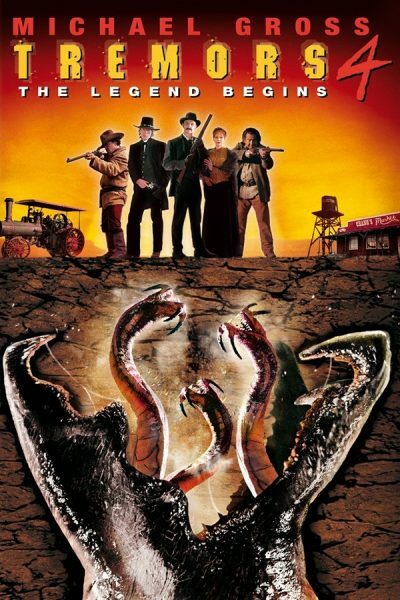 I’m also not really sure what the old west can add to the franchise, as we’ve already seen Graboids prey on horses, menace desert landscapes, attack people wearing cowboy hats and endure bullet-fire from more technologically advanced weapons…Just seems a little redundant to me. Yet I have to admit…I also really respect the filmmakers for thinking outside of the box and defying our expectations. Producing period pieces usually requires antique sets and props to be built or rented, which can be a costly venture and if “Tremors 3” proved anything it’s that the studio wanted cheap, quickly produced sequels. “Tremors 4” did not need to be this ambitious and yet the filmmakers chose to reach for the stars. I believe the reason why the “Tremors” franchise has maintained a certain amount of dignity is that S.S Wilson and Brent Maddock have been creatively involved since the beginning. They penned the script for the original “Tremors” and continued to write for the following 3 sequels and even the T.V show. They both took turns in the directors’ seat, with Wilson helming “Tremors 2” and “Tremors 4“, while Maddock directed “Tremors 3“. They obviously have a lot of respect and enthusiasm for their creation and were determined not to let the dwindling budgets derail the franchise. I thought “Tremors 2” was good, but “Tremors 3” is one of those movies where you could see the behind-the-scenes struggles on-screen and I wasn’t fond of it- even though I can tolerate it. “Tremors 4: The Legend Begins” is…OK, at least in parts. When I rented it in 2004, I was underwhelmed, but I think it has gotten a little better with age. “Tremors 4” not only takes the story back in time, but it also returns to its tonal roots by balancing horror and comedy, which I find to be an integral part of the franchise’s identity. I want a side of thrills with my order of humor, thank you very much and “Tremors 4“…sort of delivers in this regard. S.S Wilson is a MUCH better director than Maddock, so is able to craft some impressive visuals (the bridge) and even keep us in suspense. The segment where Hiram, Juan and Black Hand Kelly are searching for the monsters had kind of a spooky atmosphere that built up anticipation for the eventual attack, which is my favorite scene- The Mill siege. The use of sound was effective and the mounting tension really got to me, which paid off with the reveal of the traditional Graboid. It was exciting, intense and the SPECIAL EFFECTS WERE ACTUALLY PRETTY GOOD! “Tremors 4” primarily uses practical effects, favoring puppetry and animatronics over CGI. You can tell that Wilson is cutting corners though, as there is a lack of variety in the angles during the attack scenes and sometimes the lighting is so dark that the visual is completely obscured. Furthermore, the effects are probably only solid because they’re used sparingly. Throughout the first hour, we barely get any monster action and this draws attention to some flaws within the narrative. The characters spend the majority of the running-time safely out of harms way, as the graboids aren’t hunting near the town (yet). Our heroes only experience any kind of danger when they’re investigating the mines, which is not often, so there isn’t any overarching suspense. It’s also pretty easy to tell who is going to live and who will die, so the stakes feel low- not helped by its prequel status. There is a lot of down-time here, so “Tremors 4” is only sporadically entertaining. I really liked the middle block and the fun finale, but the rest of the content is mostly padding. It has become a Tremors tradition that the Graboids mutate into something else, but this time something else mutates into the Graboids. They’re called ‘desert dragons’ and they’re just mini-graboids who can launch out of the ground. They’re not very impressive, but I’m glad they’re underwhelming because a cooler design would’ve stolen momentum from the Graboids. I was glad to see the big guys back as the primary antagonists, because the Graboids are both cooler and scarier than the Shreikers, Assblasters and Desert Dragons. The humor comes mostly in the form of the quirky characterizations and unfortunately, I didn’t find them to be particularly funny or interesting. They aren’t badly written and I have to applaud the ethnic diversity of the cast, but the script can’t seem to figure out what exactly to do with the majority of them. Throughout the first 45 minutes or so, Hiram (Michael Gross) develops a repertoire with the majority of the characters, but this plays out in segments. He has romantic tension with Miss Lord (Sara Botsford), mentors Fu-Yien (Sam Ly) and snarks with Tecopa (August Schellenberg), but these dynamics are underdeveloped and wasted because he leaves with his sidekick Juan (Brent Roam) and ‘Black Hand’ Kelly (Billy Drago) to hunt Graboids. They fade into the background, so it’s hard to become attached to them or their relationships. Kelly is easily the best character of this movie and I really liked his interactions with Hiram, but he isn’t in it enough for “Tremors 4” to use him as a crutch. Juan is the most prominent supporting character, sharing the most screen-time with Hiram, but he’s too submissive to banter with him and he never rises above his sidekick role. He’s actually the most boring character of the movie. As for Hiram, he’s a decent protagonist, but sometimes his snobbish attitude got old. Yet we’re supposed to be talking about the comedy and instead of gags or lines, we’re supposed to laugh at Hiram’s reactions towards the townsfolk and their reactions towards Hiram. I rarely laughed, but I never groaned either. The dialogue probably carries a lot of the blame, as it’s trying too hard to sound authentic and colorful at once, but the actors are clearly struggling with it. These lines sound awkward coming out of their mouths, which probably affected the comedic timing. At least Michael Gross embraces his role with the same enthusiasm he puts into Burt and Billy Drago steals the show in his limited screen-time. The acting isn’t terrible overall, but “Tremors 4” probably has the weakest cast, characters and comedy of the entire franchise (so far). Even “Tremors 3” scored more points on these levels, although it also misfired a lot more too. I feel kind of bad for sounding so critical though, as at least the characters have personalities, making them more interesting than most survivors and victims of the horror genre. Its predecessors have set the standard too high in this area, I guess. Once again, I feel like everyone- from the writer to the actors- is trying their hardest, but there isn’t a lot of chemistry amongst the bulk of the cast. So this was a strange review, as “Tremors 4” feels more like a true follow-up to “Tremors” and “Tremors 2” than “Tremors 3” was. but I’m not entirely sure it’s superior- at least when it comes to providing a good time. “Tremors 3“ had better acting, faster pacing and a little more success with the humor, but “Tremors 4” feels a lot more cinematic, making better use of its production values. The directing, editing, music and effects are a lot more professionally executed and the movie definitely has more high points. I can see an argument being made for “Tremors 3” being the more entertaining sequel, but I personally prefer “Tremors 4” for containing both horror and comedy- even if the humor fell flat for me and there wasn’t enough horror. The suspense is more successful than the humor, but this is only from my perspective and you might find this to be hilarious. Or you might find this to be a total bore. Choosing between “Tremors 3” and “Tremors 4” is like comparing apples and oranges, but perhaps a more apt comparison would be sushi or caviar, because neither or both might be for you. Violence: PG-13. It’s grislier than its predecessor, although safe within the rating. Overall: “Tremors 4” is a passable prequel, working better in parts than as a whole. But it’s also kind of underwhelming. I actually enjoy this movie on a 2.5/4 star level, but I feel like these sequels are acquired tastes, so the higher rating might misrepresent the quality of the film.